It’s summer and you are finally heading to the lake or the beach for a much-needed vacation, or are simply off to lounge poolside on a lazy Saturday afternoon. You’ve packed your picnic lunch or your beach or pool bag with all of the fun you can find. Of course, since you’ve heard “Don’t forget the sunscreen!” for years, you’ve double-checked that you have an ample supply with you. But is it enough to protect you in the sun? Be sure to pack your hats, sunglasses, and clothing to block the sun’s harmful rays as well. In today’s society, taking care of our bodies and maintaining our health is a common topic. The skin is our largest organ, the important first defense for our immune system, and yet we tend to neglect it the most. Remember last summer when you took a trip to the park for half an hour and were burned so badly that you peeled? The sun didn’t seem that hot; in fact, it was overcast, but you forgot how the sun’s UV rays can easily penetrate cloud cover, reflecting and burning you in no time. And, naturally, you want a little color now that it is finally summer, right? We tend to believe that at least a little tan gives our skin a natural and healthy glow. But what is a tan? Every time you tan, you are damaging your skin. A tan is the natural way for our bodies to protect themselves from the harmful UV rays that cause damage to our cells’ DNA. The pigment in your skin darkens whenever it is exposed to the sun’s rays, which causes your skin to age more quickly and produces fine lines and wrinkles. 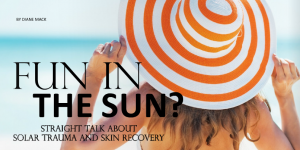 There is a lot of controversy surrounding chemical sunscreens and the damage they can cause. Do your research about sunscreens and decide for yourself which are safe for you and your family. Remember, companies hire and pay entire marketing departments to sell you their products. Just because you know the brand does not mean it is safe for use. I recommend a product that contains either zinc oxide or titanium dioxide. There are many new formulas available now that are easy to apply. Avoid products which contain isopropyl alcohol, parabens, and chemical preservatives. What do you do if you get more sun than anticipated? First of all, if the burn is severe and causes other medical concerns such as a fever, seek medical attention. Some things you can do to help your skin heal include staying hydrated by drinking plenty of water, using moisturizers, and taking cool baths. Do not pick, peel, or pop any blisters on your skin. Use gentle cleansers, and do not scrub. Spending time outdoors enjoying the glorious summer weather is something we all want to do. But exposing our skin to the sun’s harmful rays is something we need to avoid so we can protect it and ensure it stays healthy as possible. So be sure to make wise choices about your summer skin care, and you will be blessed with a beautiful glow all year long. 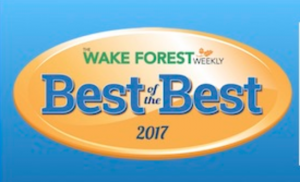 Diane Mack is a licensed esthetician and oncology certified esthetician, and is the owner of Esthetics By Caris, located inside Atlas Health & Wellness Associates, 152 Capcom Ave., Suite 104 in Wake Forest. 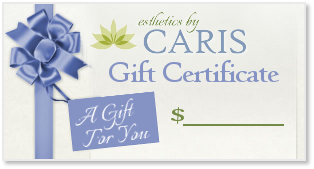 For questions or more information about summer skincare and other skin-related topics, you may reach Diane at 919-604-0646 or visit www.carisskincare.com.